A pair of Australasian Grebes has built this nest of floating plant material right in the middle of our large dam. 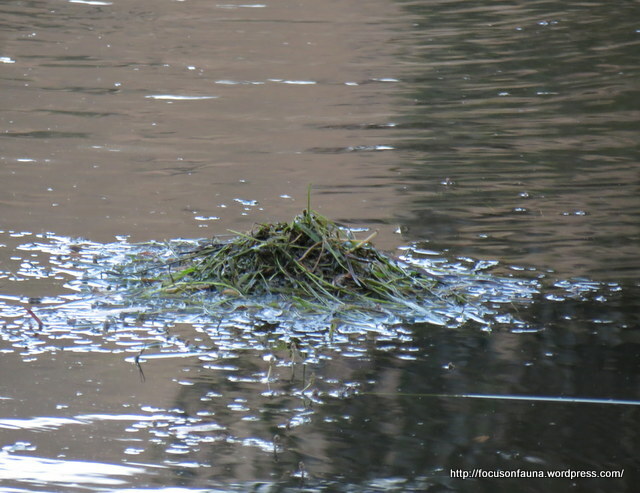 The nest appears to be anchored to underwater stems of Floating Pondweed (Potamogeton sp). It may seem vulnerable but, at the slightest disturbance, the sitting Grebe is very adept at quickly covering the eggs, slipping off into the water and pretending it’s just hanging out near a pile of reeds with not a care in the world. A hide set up in bushes on the bank and a lot of patience were needed to get the photos below. Great. I have a pair on my dam too. The young have just hatched and are happily swimming around.